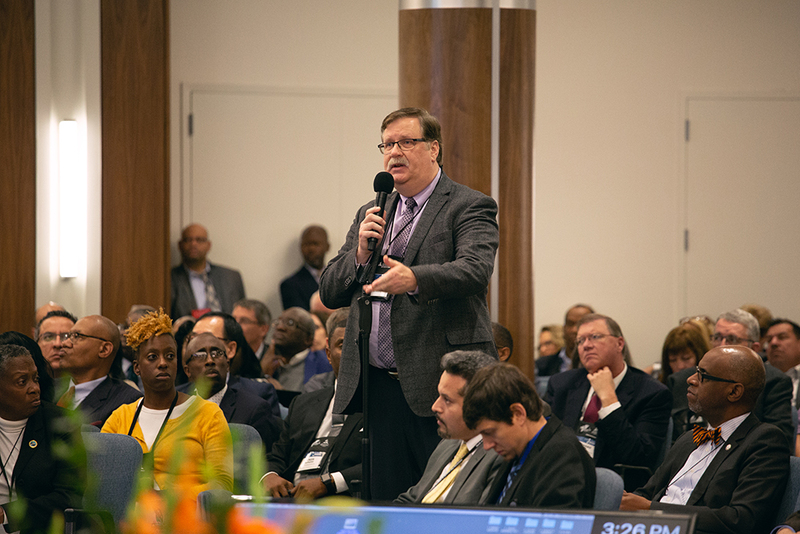 The first person to the microphone was Terry Shaw, president/CEO of Adventist Health System, who made a motion that the NAD work with the General Conference to move to some type of a different arrangement for financial parity. “I do not want to hurt the world church, but at the same time there are so many ministries right here locally that we can’t get to,” Shaw said. After a few speakers, Lee-Roy Chacon, president of the Texico Conference, asked for information on what the NAD gives to the GC. It was reported that the NAD currently gives 6.35 percent of its tithe to the GC, with a gradual reduction to 5.85 percent by 2020; the other divisions of the church give 2 percent. Delegates expressed their thoughts both for and against the motion. Some, including Juan Prestol-Puesán, GC treasurer, implored the NAD to exercise caution and a “slower approach,” saying that a reduction in that short a time would be damaging to mission around the world. “Even 5 years is too short,” said Prestol-Puesán, who also mentioned that he served for many years as the NAD treasurer before moving to the GC. Most assembled spoke in favor of the amended motion. "We've paid much for the world, and I hope we'll continue to pay much for the world,” said Randy Roberts, senior pastor of the Loma Linda University Church. “I have no hesitation there, except to say there comes a point when the giving exceeds what an entity is able to do and it becomes damaging and then it implodes." “This division has not only been the bread basket, but it has been the source of human resources that have fanned and fueled mission and growth and development in the world church for decades; I hope and pray it will continue to be. I hope and pray that we can come to an amicable resolution of the financial issue that is pregnant in this division. “Our women in the North American Division who serve as pastors and leaders will be protected by the North American Division and every conference and union president in this place. ... [The male-headship theology] was never Seventh-day Adventist, it is not Seventh-day Adventist, and it’s not going to become Seventh-day Adventist. We will continue to pray that God’s spirit will lead the church so that our women will not be held back or limited by glass ceilings that we have created in order to protect our own positions. — Click here to watch the entire Nov. 5 afternoon business session, and all the other 2018 NAD YEM sessions.